Ever since I succumbed to peer pressure and read The Truth About Forever, I’ve been a fan of Sarah Dessen’s. I know there are readers who dismiss her books as being too boring or too girly, and it’s true that it’s hard to pinpoint anything hugely dramatic that happens in her books plot-wise. But that’s exactly what I like about her novels–they’re about nothing and yet absolutely everything at the same time. In the summer before college, Emaline is working at her family’s vacation rental in the beach town of Colby when she starts to question her “perfect” relationship with her boyfriend Luke, as well as her complicated relationship with her absentee father. When a stranger named Theo comes to town, life starts to unravel…or is she finally starting to see the kind of life she really wants? Here are the things I love about this book, and about all of Dessen’s stories: the absolutely real and mundane details that make up life. Family ties that shape who you are. The spark of romantic interest. Great friendships. The pleasure of doing ordinary things, like playing silly putt putt games with your brother, or experiencing the satisfaction of doing a great job at something you’re good at. The Moon and More by Sarah Dessen also features earnest dates that tank, worries about college, the sadness of changing relationships, and the out-of-body feeling that comes when you realize your parents are actually flawed but good people. I leave every Dessen town feeling as if I’ve visited a real place full of real people who quietly go about their business and quietly dream about things that might never come true. Admittedly, the author maintains her tendency to reference the title too many times, which is a pet peeve of mine. I enjoyed reading about Emaline’s problems, but I think she could have used some more joy in this book, too. And I have to say, I wasn’t a huge fan of Theo’s, so there wasn’t as much swoon in this book as I’m used to in other novels by this author, although there’s a hint at towards the end that something great could develop down the road. But as always, Sarah Dessen delivers a terrific summer book. I like kickass heroines who can take down their enemies with a single blow who know the exact right one-liner to toss off at the right moment, but I love the more introverted heroines like the ones found in these contemporary novels, too. While a lot of fantasy authors indulge us by writing about the kind of girl we wish we’d been at the age of seventeen, Sarah Dessen writes about the kind of uncertain, quietly determined girl we actually were. And there’s plenty of beauty and wisdom and resonance in that, too. I love the way you described Dessen novels, because I think it’s completely accurate. Dessen is one of my favorite contemporary authors, mostly because I find her characters to be easy to relate to and very, very real. So glad you enjoyed The Moon and More – I can’t wait to read it! Sara Dessen is one my favorite authors out there I have all her books except the latest one which I’ll be getting soon. Thank you for sharing your review. I’m a fan of Sarah Dessen and this sounds like a great summer read. Her books are a nice break from the constant stream of books about uncertain futures and creatures that haunt you in the night. I’m looking forward to it! Oh fantastic review! I’m really excited to read this one. And all of the new covers are so pretty! Can’t read this review yet, because I have yet to read this one but when I do I shall return! I’m excited to read this because it’s Dessen, even if I didn’t really like her last book. She’s always been a comfort read for me, and I’m looking forward to her Easter Eggs (there are some here, right?). My friend read this recently and suggested that I read it. It sounds pretty interesting. Ooh, this sounds lovely. Only a few days ago, the owner of a local bookshop asked me if I’d read it—it keeps popping up! I’ll definitely have to give The Moon and More a try. My usual reads tend to be more fantasy-like, and the thought of reading a quieter but still powerful book is very refreshing. What a gorgeous review, Wendy! I’ve definitely heard similar sentiments about Theo and the level of swoon-worthy things in this book. But you’re completely right–there’s always that certain beauty in Dessen’s books. I love the way she captures a shy protagonist and writes about her transformation. And I love how she constructs families and their problems. Love your review, Wendy! Can’t wait to read this one. I’m such a big fan of Sarah Dessen. After reading this post, I really think I should check out Sarah Dessen’s books. I usually go for paranormal or dystopian, but this seems like a fun summer read. 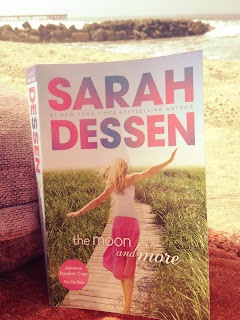 I can’t wait to get my hand on The Moon and More I lurhve Sarah Dessen’s books! I love Sarah Dessen. I can always count on her for a fun quick-read that will make me think a little bit. I’ll admit that I have yet to read a Sarah Dessen book, but sometimes I just need one of those “too girly” books. Besides, I have heard a lot of good things about both her and her novels, so much like Nikki, I really should remedy this situation. I’ve never read any of Sarah Dessen’s books (I know, I know – will be remedying that soon!! ), but they sound amazing. I do love quieter books with a lot of heart. Hehe, I like that you say you “succumbed to peer pressure” in reading The Truth About Forever and falling in love with Sarah Dessen because that’s exactly what happened to me!! But funnily enough, I succumbed to this peer pressure on my last night in Paris, knowing I’d need to wake up at 6am to catch a flight. Stayed up late finishing it, didn’t fall asleep til 4:30, and BARELY made my plane! Since then, though, I’ve read–and loved–tons of Dessen and it’s a funny story about how I first became acquainted with her. :) Looking forward to reading this one on a beach this summer! I loved The Truth About Forever and I can’t wait to read another book from this author. You are so lucky for receiving an ARC and I am now even more excited to get my hands on this book as well! Beautiful review, Wendy! I totally agree with you about her novels, they explore issues that may seem small but Dessen surely places in great aspects like family tension/relationship and VERY cute romances. I’m glad The Moon and More was no exception- I look forward to reading it. Like wendy-book-scents, I’ve never read any Dessen before, and your post has convinced me that I’m seriously missing out. I have a couple of thoughts to express on the subject of the somewhat mundane nature of such books when compared to more exciting ones from the fantasy or sci-fi genre. Mainly that no matter how effective fantastical stories can be in portraying our society in different scenarios, how they’d be different but still intrinsically the same, sometimes a good old contemporary is just what is needed to throw things back in perspective, to accurately illustrate how life actually IS. They strip everything down to its skeleton and then beautify it. I’ve learned a lot from fantasy novels, that I’ll admit, but contemporaries just seem to be easier to relate to at times. So I actually haven’t read any Sarah Dessen before. I just never did and then there were so many of them that I really didn’t know which one to start with. So I haven’t delved into it at all. But this does sound like a good summer read so I want to check it out! Oh Wendy, this is a lovely review. Sarah definitely writes about girls we WERE, and I think that’s why a lot of people identify with her books so much. I’ve read two of hers now and liked them both. It’s interesting this one is set on Colby, again – I wonder if we see any familiar faces?! Referencing the title too often is really weird. Once or twice is enough IMO! I’ve read all of Sarah Dessen’s books but this one. I absolutely need this! I’ve managed, somehow, to never ever read a Dessen book. All my friends in high school read them but I guess I missed the boat. Whoops! I’m reading at least two this summer, though, so I’m excited. And in general, I think the simple stories about people being themselves without a lot of fanfare tend to work the best for me. Everything you have to say about this book sounds like something I would totally love. Interesting about the author’s constant reference of the title, though! It’s one of my pet peeves as well, and I always find that it pulls me out of the story and gives the text a sort of gimmicky feel. I actually really loved how Dessen referenced the title a lot…mainly because I really like this title and thought it fit the themes of the book really well. My favorite books of hers are Just Listen and The Truth About Forever :) I’m excited to read this one! I have to admit … I have not read a Sarah Dessen book. I know she’s a big deal, but I only recently started to read contemporary YA. I’ve always been more interested in scifi/fantasy/horror/paranormal things instead of normal books. But I know I really need to read a Dessen book. And this one sounds like a good start. My preorder arrived early so I read this one over the past couple of days. I didn’t love it, but I did enjoy it overall. At this point I don’t think anything will ever live up to The Truth About Forever for me, but I still enjoy reading her books. They kind of feel like coming home to me, with the little bits of character references and the familiar settings. Huh… I guess I’ve been guilty of dismissing Sarah’s books as too “teeny”. I’m in my 30’s and I tend to avoid the angsty, teeny books but this actually sounds interesting. Definitely going to have to go take a better look. Thanks for the great review! I have never read a Sarah Dessen book but this one sounds great! I’m a huge fan of contemporary novels and so I have a feeling this might be a great book for me to read. Thanks for the awesome review! Hah, your name always confuses me, Jon–I’m used to thinking of you as Scott! I haven’t read Sarah Dessen but she seems to be a very popular YA writer. I do like YA books but not if they are too immature. I am looking forward to reading this after your review! She is–and I totally didn’t trust that popularity at all, but I’m glad I ended up giving her a shot because I really like her books. Definitely one that’s a particular taste, though–I hope you like her style when you give her a try! I’m definitely not surprised by the reviews for this newest Sarah Dessen release. I’ve for the most part been able to enjoy her novels across the board. There have been 1 or 2 that irked me, but it’s usually for personal reasons. This sounds like another fantastic read from the lighter fluffy side of YA. I think I’ve rated just two of her books 3 stars, the rest were 3.5 – 4 stars. They’re just such a nice change from Issue Books which are so prevalent in realistic YA, imo. I have yet to read an SD novel, but I’ve heard a she’s great and sometimes the lack of drama simply highlights beautiful writing and strong characters all the more. Great review. I totally agree–I think we’re actually seeing an upswing in very melodramatic contemporary novels, many of which tire me out, hah. Thanks for stopping by. It’s been a while since I’ve read a Sarah Dessen book, but I am pretty interested in giving this one a shot, especially after reading your review. Her books have been kind of hit and miss for me: I LOVED The Truth About Forever and Someone Like You, but some of her others just didn’t work for me. It sounds like, for the most part anyway, The Moon and More contains the elements of her stories that I love, especially the realistically flawed characters. Some of her books are definitely better than others, so I understand the hit or miss thing. I hope you end up enjoying this if you give it a try, Chloe. This one sounds lovely, I’m glad you enjoyed this! Still need to get around to finally reading a Dessen… some day. :) Great review! I honestly haven’t read any of Sarah Dessen’s book in a couple of years because of the somewhat cliche stories. But after reading your review, I want to get into Dessen again, because I did enjoy This Lullaby and Just Listen! Thanks for the review! And the cover is to die for. They are, in a way, pretty formulaic, because she uses the same basic set-up on the surface, but her best books really do vary the themes and characters in a way that I find really interesting. The two books you mention are two of my faves of hers too, so maybe you’ll enjoy this, too! Reading Dessen at the beach is…perfect. I don’t know what to feel about the plot, but any Sarah Dessen book is an auto-buy for me. Strangely enough, she’s an auto-buy for me, too. If you’re a fan of hers, I bet you’ll like this, despite your reservations about the plot! I don’t even really pay attention to her blurbs anyway, I just always know I’m going to enjoy the time I spend with her characters. Love this review, Wendy. Especially that final paragraph because its the truth. Too often we read books that take us away from ourselves that we forget to read books that ARE about us. Love! I may be one of the only people in the world who have not read a Dessen book! I own two of them and really want to get to reading them but I just haven’t found the time. Too bad you didn’t like Theo better, it’s always tough for me when I don’t like the love interest. Fabulous review, Wendy! Happy that Dessen books are continuing to be great for you. Jenni, two years ago, I was you! I hope you give her a shot sometime, I was pleasantly surprised by how much I like her books. It’s usually tough for me if I don’t like the love interest also, but it doesn’t really even matter that much here, because the book is about so much more than just the love story. I liked Emaline a lot, and I like Luke, too, even though he’s not in it very much. Wonderful review, Wendy! I agree that Dessen’s books are about nothing and everything. And that is what makes them so important and special. These stories are about the personal quest of finding yourself or your truth. Yes, that’s exactly it! I also think she has a lovely way of finding what’s special/appealing/unique about people without it feeling as though she’s trying to hard to give them character quirks, and the books feel so human and real because of that. Based on the blurb I was expecting a love triangle and I was SO happy that this was about a girl learning a little bit more about herself, not just obsessing over which boy she should choose. Yeah, thank goodness there wasn’t an angsty love triangle. I generally like the way she handles romance (and its balance in her heroines’ lives), though, so I wasn’t too concerned. Will definitely read Along for the Ride! You have me very intrigued. I can’t read this review yet, as I’m quite excited to read this one and go in with no expectations. I recently read my FIRST EVER Dessen novel, ‘This Lullaby’, and was pleasantly surprised – so now I’m super excited for ‘The Moon and More’. Ohhh, I’m excited you’re a new Dessen convert! Welcome to the fold, my pretty. Do give The Truth About Forever and Just Listen as well, I think you’d enjoy those in addition to this one. Look forward to hearing what you think! She has an amazing way of getting you so absorbed in all these characters’ lives and caring about what happens to them, even when not very much is happening at all. I’m glad you agree re: the happy! I expected a bit more at the end, though I actually have felt that a few times with Dessen books. Right? I wish I’d been totally confident and brave and kickass at 17, but I know that was only internally, not externally. I think she portrays girls in a very realistic way. I hope you have a better experience with your next Dessen! They’re just very comfortable reads to me. I haven’t read any Sarah Dessen’s either. I should remedy that situations soon. Maybe I’ll grab one of her books when I go on vacation in two weeks. Shock horror I have not read any Sarah Dressen. I know I should, but I haven’t yet. I keep seeing this one pop up . So I had better nab it. This, or The Truth About Forever or Just Listen. :) I like recommending those latter two for Dessen newbies! I’m not really into contemporary, but I’ve heard before that Sarah Dessen writes really realistic stories and characters that people can relate to. And if there is no swooning, I think I might give her books a try sooner than I planned (which was, actually, never…). I’m curious to see what the hype is all about. Actually, Dessen was one of the very first authors who turned me onto the occasional contemporary YA book. (The link for The Truth About Forever takes you to my review–I actually used to make fun of the pretty pretty covers, hah.) I was just saying to Kate a few comments above yours that even though romance is a part of all of her books, the amount of swoon is really nicely incorporated into every girl’s overall life. The books are never just about getting the boy–there are awesome friendships and adults and school and summer and jobs and all kinds of other things that keep her busy. Awesome review Wendy. I loved how you said that the author using realistic aspects. That’s one reason why I love reading her books. Thanks for sharing. She really captures everyday life with all of its mundane and marvelous details in a way that no other contemporary YA author does. I’m glad you’re a fan, too! Oh yes, every book is like reliving summer vacations from school. I love that so much! I liked both those books better than this one too, Keertana, but I think you’ll still find this one has a lot to recommend it. She definitely does not do the expected in this book. Sarah Dessen’s books seems like *the* YA Contemporary books. I wouldn’t be lying when I say that the bookstore I got to has a contemporary shelf filled with almost just Sarah Dessen. I would actually recommend starting with The Truth About Forever or Just Listen, Lottie Eve–I think those two represent her best books, although I certainly enjoyed all the others, too! If the idea of the beauty in the mundane details, I think you’ll like her a lot. :) I hope so, anyway. I loved this book because there was no swooning. It felt very real and you are right about the mundane making up all of the importanmt things in life. It was not an epic summer for Emmaline, but it changed her in some signiicant ways. This was my first Dessen book and I will be reading more! I think you’ll find that Dessen books do a really nice job of balancing relationships in the right context of her girls’ lives, Kate. I’m really excited that you liked this, and that you have so many more Dessens to read! I’ve honestly liked them all, and a few of them I’ve also loved. Sarah Dessen totally faked me out with the swooning, but I loved it in the end. I know what you mean–I suspect some readers may not like some of the choices, but I thought it was overall pretty realistic. I liked that peek at potential happiness at the end, though.